Odd Lots: Revisiting Gordon Matta-Clark’s Fake Estates examines the legacy of Gordon Matta-Clark (1943-1978) through the history of his important project Fake Estates (1973-4). With 19 participating artists ranging from Matta-Clark’s contemporaries to emerging practitioners, Odd Lots seeks to activate the legacy of an “artist’s artist” whose dovetailing interests in architecture, sculpture, and performance have inspired creative producers in a variety of disciplines. Odd Lots de-emphasizes the image of Matta-Clark as a chainsaw-wielding urban land artist obsessed with the “object to be destroyed.” Instead, the exhibition underscores aspects of his work that investigate dematerialization, use value, and systems of social organization. The exhibition, with elements at White Columns and Queens Museum of Art, was conceived and curated by Cabinet editors Jeffrey Kastner, Sina Najafi, and Frances Richard. In the early 1970s, Matta-Clark discovered that the City of New York periodically auctioned off “gutterspace”—unusably small slivers of land sliced from the city grid through anomalies in surveying, zoning, and public-works expansion. He purchased fifteen of these lots, fourteen in Queens and one in Staten Island. Over the next years, he collected the maps, deeds, and other bureaucratic documentation attached to the slivers; photographed, spoke, and wrote about them; and considered using them as sites for his unique brand of “anarchitectural” intervention into urban space. Matta-Clark died in 1978 at the age of 35 without realizing his plans for Fake Estates, and ownership of the properties reverted to the city. The archival material that he had assembled went into storage and was not rediscovered until the early 1990s, when it was assembled into exhibitable collages. Thus, the Fake Estates have emerged not only as a mordant commentary on issues surrounding property, materiality, and disappearance that marked the whole of Matta-Clark’s career, but as artifacts of his own estate, reminders of the powers of absence and presence that govern our relationship to the past. Odd Lots is organized in two parts. 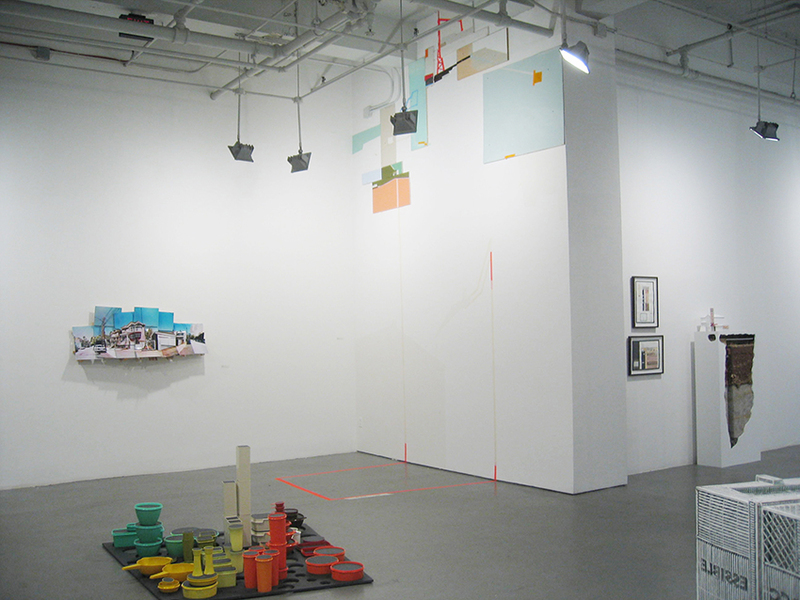 The contemporary portion of the show invites nineteen artists to present speculative projects responding to the provocation of the interstitial “gutterspaces.” Working in a variety of media, the participating artists consider the ways in which the Fake Estates sites and Matta-Clark’s purchase of them might be used as contexts—literal or metaphorical—for new sculpture, drawing, photography, performance, and installation. The City of New York no longer auctions “curb properties,” but Cabinet has obtained licenses for the ten original slivers still on the city’s books. Taking this nominal jurisdiction as a starting-point, the artists propose fantasy excavations, fleeting performances, interactions with the neighbors, and spatial or atmospheric re-imaginings of the land as site, symbol, and situation. Including projects originally created for the “Property” issue of Cabinet magazine in 2003, Odd Lots will present commissioned works installed in the galleries of White Columns, an alternative art venue founded as 112 Greene Street in 1970 by Jeffrey Lew and Gordon Matta-Clark. The historical component of Odd Lots, at the Queens Museum of Art, will utilize the 9,335 square-foot Panorama of the City of New York to examine the history of Matta-Clark’s project and the bureaucratic origins of the property slivers. The Fake Estates sites will be marked on the Panorama, while multimedia documentation will trace the origins of the slivers themselves by revealing the ways in which administrative procedures in Queens County produced these idiosyncratic spaces. A selection of Matta-Clark’s Fake Estates collages will also be on display. In addition, on view at both venues will be a recently rediscovered film, shot in 1976 by video artist and cable television pioneer Jaime Davidovich, documenting a visit to the Queens sites by Gordon Matta-Clark. In addition to the artists’ projects at White Columns and the installation of archival material and Matta-Clark’s original documents at the New York City Panorama at the Queens Museum, Odd Lots offers a series of bus tours to selected Fake Estates sites in Queens. Acknowledging that the land itself is not identical to the cultural devices that frame it—such as maps, deeds, and leases, or even artworks—the bus tours will bring viewers face to face with the magnificently mundane slivers themselves. Each tour will be guided by a special guest tour-guide or team of guides, and will last approximately 2 hours. Tours begin at the QMA at 2 pm. Jimbo Blachly, Lytle Shaw, and the Chadwicks-two nineteenth-century dandies-lead a Grand Tour of Matta-Clark’s Queens. Nato Thompson leads a tour of the tactical resistance of everyday life. From ebullient window displays to Maoist bakeries to cars parked in the wrong direction, the resistance that surrounds our everyday lives will be exposed. Please note: Space is limited and spots should be reserved in advance by calling 718.592.9700 x128 or emailing cur-intern@queensmuseum.org.